OnTheWay, a brand new app for the adventurous traveller, has just launched its public beta. The Web-based app makes it easy to plan your road trips in advance, by letting you know all about the interesting places you can stop at on your way. OnTheWay is a project which comes to us courtesy of TeachStreet, a Seattle-based team who put together the app in the space of just one week. When you first fire up the app in your browser you’ll be presented with a map and a small sidebar where you can search for your personal trip. Without signing up, all you have to do is enter the spot where you’re starting and where you’re headed, and OnTheWay will generate all the possible routes you can take. Once you’ve selected your route, hit the ‘show stuff’ button and your trip will be divided into a series of legs, showing you all of the diners, coffee shops, petrol stations, restaurants, sights, gyms, parks and more that you’ll be passing by. 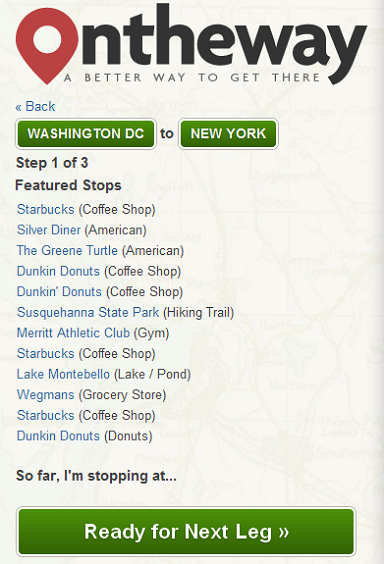 The stops will be listed in the sidebar, and will also be displayed on the map so that you know how far you have to go before you get to your next stop. 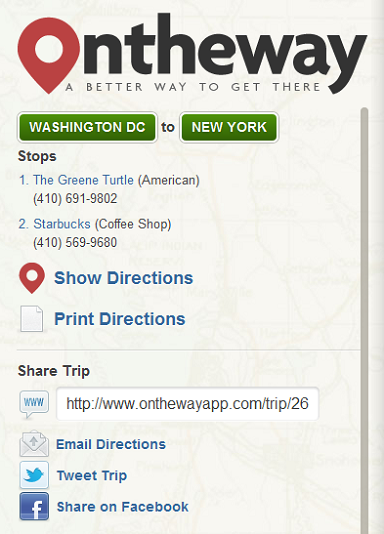 Clicking items on the map will display a bit more information about each stop, where you can also add them to your trip. After you’ve selected all of your stops, you can see exact directions, print them out, and share your trip via email, Twitter or Facebook, or save the URL. 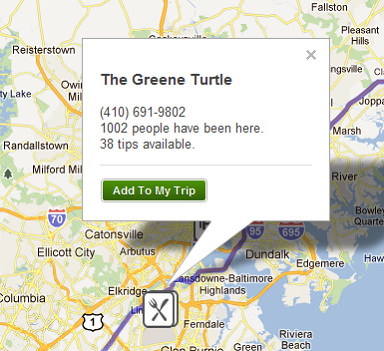 Since you don’t have to sign up for an account to use the app, if you want to save your trips, just bookmark that link. You can also connect OnTheWay to your Foursquare account to get additional suggestions. You’ll be happy to know that the app can be used not just to plan road trips in the US – while it’s not for all countries, it covers an impressive amount of ground worldwide. OnTheWay is ideally used before you hit the road, giving you the chance to prepare for your drive, and know exactly where you can stop to fill up your car, get yourself a cup of coffee, or even do a bit of sightseeing that you would have otherwise missed. That said we do have a short wishlist which consists of just a couple of things. User accounts would be a great way to save your trips and we certainly wouldn’t say no to a mobile app which makes last minute stops easy to find. While you can access the site on your mobile browser, we found the experience on Android to be a little buggy, but testing it on an iPad, the experience was flawless. 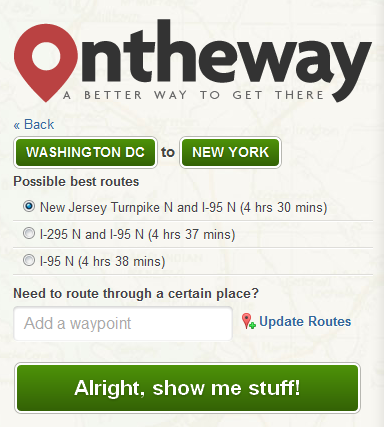 The site is simple and doesn’t aim to do more than make it easier than ever to plan your road trips. It addresses a specific issue, and it addresses it well.